Crafting is near and dear to my heart and I realize that it is shamefully under represented here at The Apple Crate. 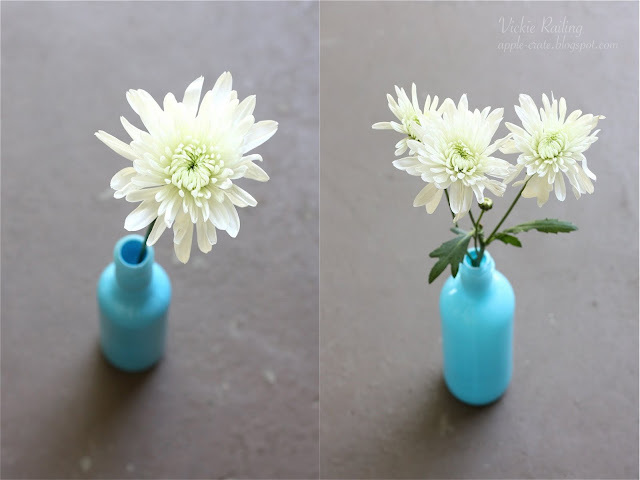 So today I bring you a project that has long been in the making, recycled jars and bottles as vases! I have Martha Stewart to thank for the idea. She has a great tutorial on her website that I followed to make these. Lots of people are out there doing something similar, with either spray paint or acrylic paint. But what I appreciated about the Martha Stewart version is that the paint is actually on the inside of the bottle, so it won't chip as easily, and it uses enamel paint so I can actually fill the vases with water. I started out by collecting old bottles and jars; things I went through in the kitchen and saved rather than recycled. I even enlisted the help of some friends to speed the process up. These bottles once held everything under the sun: jam, olive oil, soy sauce, wine, spaghetti sauce, salsa, spices, etc. The tutorial was a little vague on what kind of paint to use. It did specify enamel, and offered that it would be readily available at craft stores. Hmph. 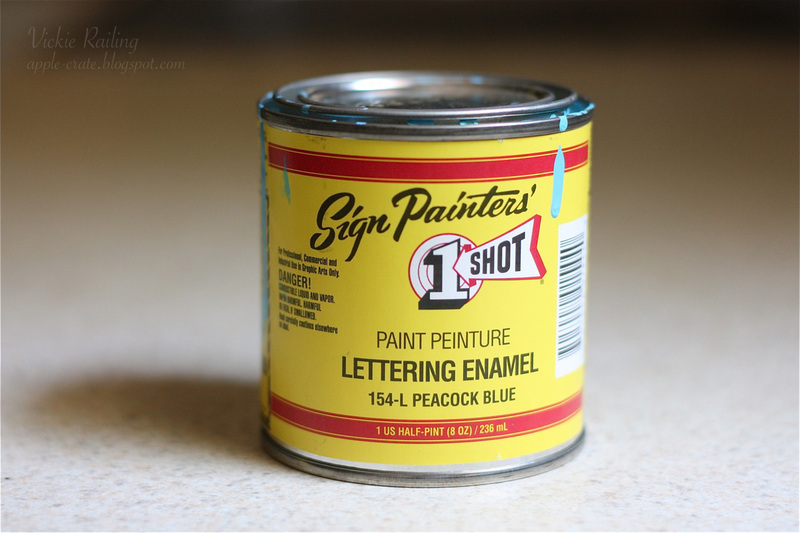 After searching the usual craft store suspects I found spray on enamel, model paint enamel (available in .25 oz. bottles, not so helpful), and a kind of enamel that seemed more for decorative painting on the outside of glass and had to be baked on. I tried hardware stores, too, but nothing seemed quite right. Then I found this paint at a local art supply store. It is actually for sign painting but it was enamel, didn't require a baking process, and was specifically for outdoor use so I knew it could hold water. It worked perfectly! And here are my lovely jars and bottles! I used about half of the 8 oz. can of paint to cover all of these. The painting method I found to work for me was to spoon the paint into the jar with a plastic spoon, then swirl it around inside. For the first few I drained the excess paint back into the can, then laid them on paper towels to drain the rest of the way like the tutorial recommended. But that was super messy. Many of my bottles have narrow mouths and were too unstable to be left upside down to drain the rest of the way. So I just drained as much as I could back into the can and then set them upright to dry. The paint may be a little thicker on the bottom of mine, but it sure was a lot easier. One thing I would recommend is having some paint thinner on hand. Inevitably you are going to get smudges on the outside of the bottle or need to clean up around the mouth of the jar. And paint thinner makes cleaning those spots a breeze. I was so excited to finally put some fresh flowers in and see how they looked. Aren't they gorgeous?! 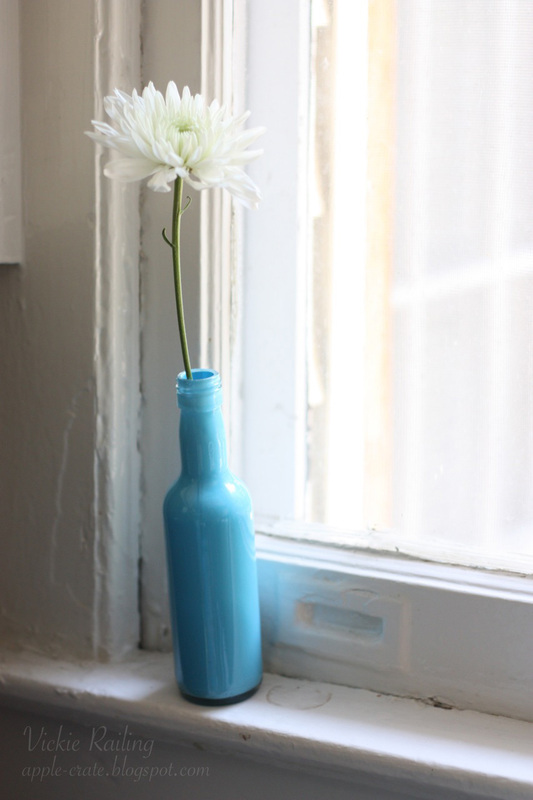 My smallest bottle makes a sweet bud vase in the windowsill. One of the great things about this project is how economical it is. The glass was free so all I bought was the paint. 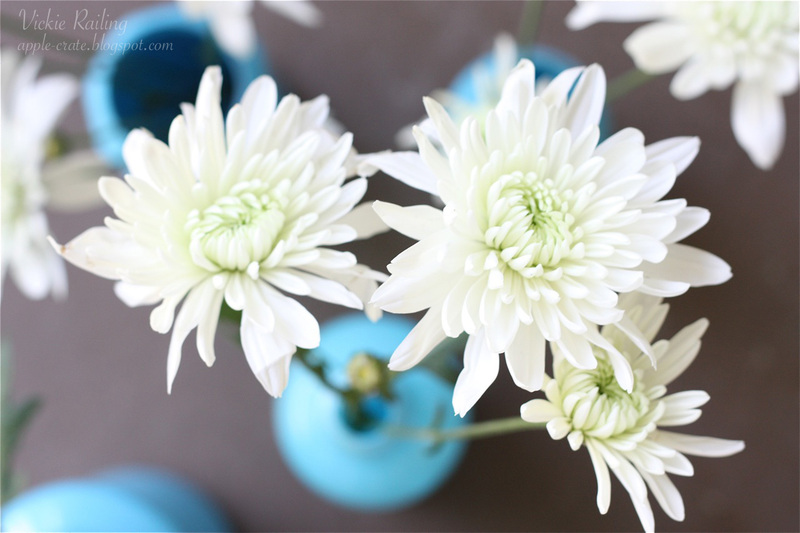 And just one bunch of mums filled all of my new vases! It really gives a lot of bang to your flower buying buck. I think these would look fantastic in a line down a dining room table as a centerpiece. 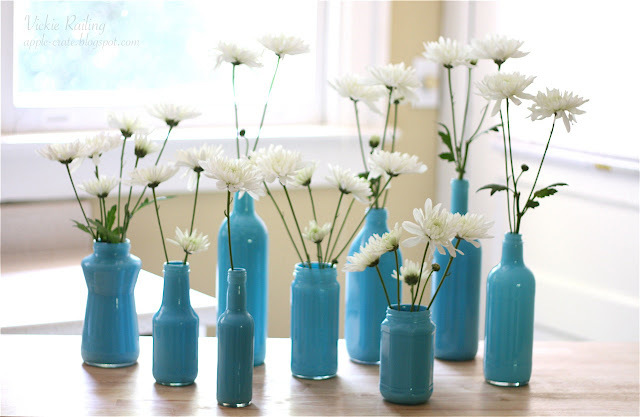 Or just dispersed around the house to add fresh flowers in many little places. 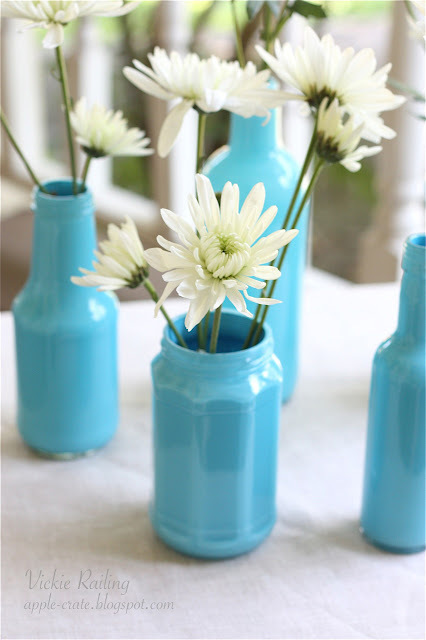 They would also be a great way to continue a color theme for a party or event. Your bottles are so cute! I really need to try this out! these are really beautiful and pretty easy to put together (from the tutorial anyways!) Can't wait to try it. gorgeous! just wondering what happens over time with the water and the paint. I read that the paint will peel and one shouldn't use water in the bottles. Did that happen in your case? thanks so much and would love to see you at my weekly linky party, Craft Schooling Sunday! I love this idea! 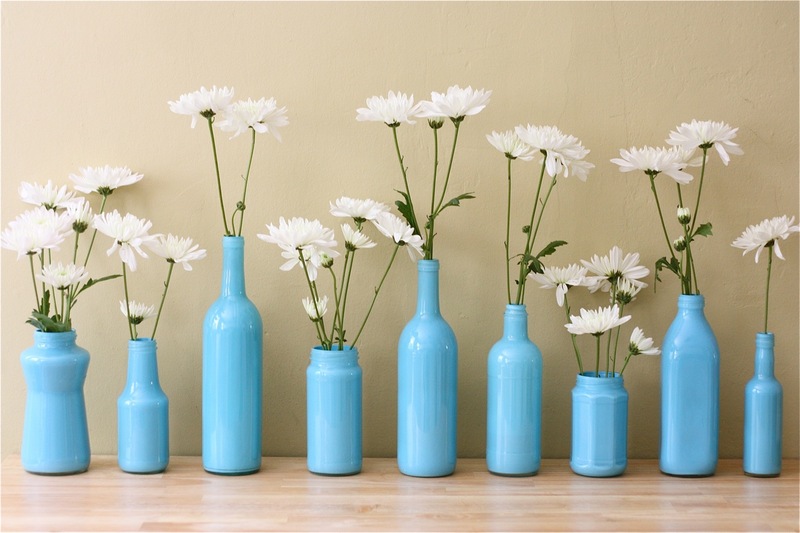 I need purple vases for a party soon and this would be a perfect way to do it on the cheap. Thanks for the tutorial. They are absolutely beautiful! I love love love the color that you chose and thanks for the vegetable oil tip...I'll be trying this soon! Wow, I love these! They are so vibrant and look wonderful with the contrast of the white mums. Beautiful work! Amazing! I wanna do that SO badly now! 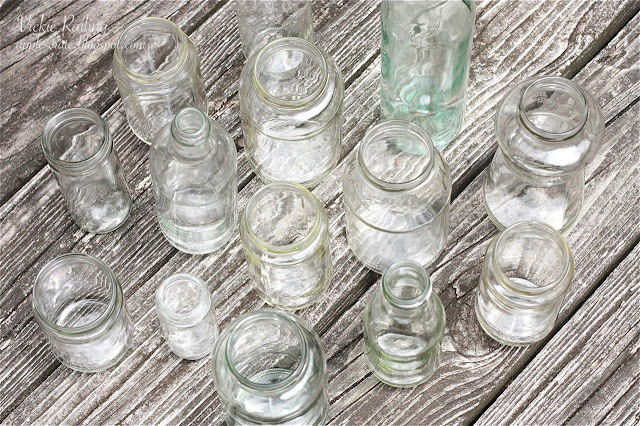 Time to find some glass jars. Just wondering, did you have any problems with the paint melting in the sun? I love this look and I am currently trying to accomplish this by painting bottles. I have tried 2 other paints and every time I leave them to dry they get all cracked and the paint does not cover all the sides. Does this happen with this particular paint? Hi! This paint was very thick and covered well. I had no problems with cracking as the paint dried on any of them. Good luck if you try this! Thanks Martha Stewart for such a cute idea! And thank you Apple Crate for sharing :) Just tried this for the first time to give as a housewarming gift. I used the enamel paint from Michael's... the ones that live right with the glass vases, etc. Will be letting them sit for two days and then baking them. The instructions for this technique are right on the bottle. 1. 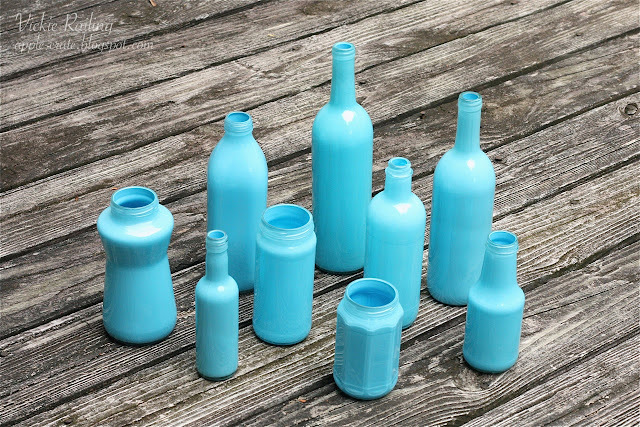 Rinse the glass with rubbing alcohol before putting the paint on as it adheres much better. 3. Keep the lids to your jars, as it's so much easier to shake the paint around and get it to cover the space with the lids on... especially with wide mouth jars. I didn't do this one one wide mouth jar, and it looks horribly painted on the inside. Hope that helps... my sense is that you have to just keep practicing to see what works and what doesn't. Cheers, and thanks again for the great idea! Really cool idea! Want to do this as well. Already started to collect some inspiring pic's, and yours definettly are! We moved to a little country house last April, I found a little pile of old bottles under the back deck. I knew I wanted to create something with them. Each bottle is very different from the other. I will do exactly this with them and post before and afters. Thank you! Hello! I'm Vickie, a Northwest girl transplanted to the Northeast. I love papercrafting, baking, and all things homemade! The Apple Crate Turns 1!